WASHINGTON, DC.- Some 135 of the most significant and beautiful drawings made over a period of three centuries by the best French artists working at home and abroad and by foreign artists working in France will be on view in Renaissance to Revolution: French Drawings from the National Gallery of Art, 1500–1800 in the Gallery's West Building from October 1, 2009, through January 31, 2010. This is the first comprehensive exhibition and catalogue to focus on the Gallery's permanent collection of French old master drawings, which is remarkable for its breadth, depth, and individual masterpieces. 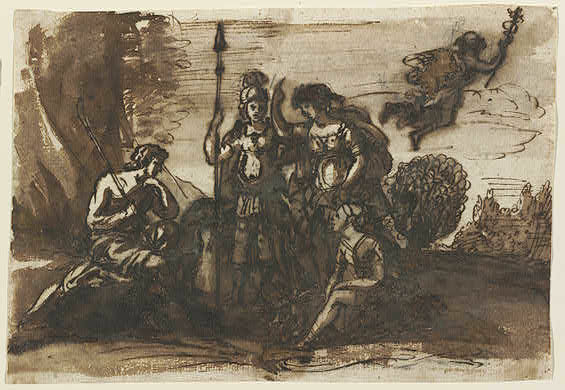 "One of the true glories of the National Gallery of Art's holdings of graphic art is its outstanding collection of French old master drawings," said Earl A. Powell III, director, National Gallery of Art. "The exhibition Renaissance to Revolution and the accompanying catalogue celebrate the singular originality, elegance, and spirit of French draftsmanship." 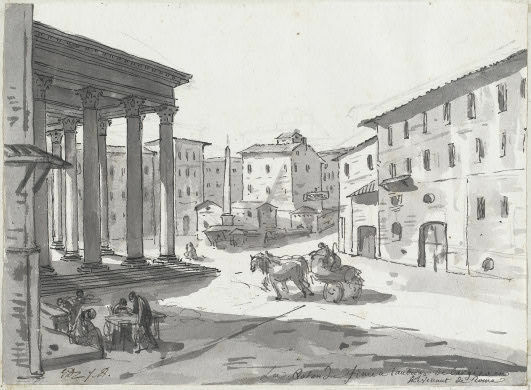 Among the National Gallery of Art's extensive holdings of approximately 100,000 works on paper, the collection of 6,000 European drawings includes more than 900 French old master drawings which stand out as a particular treasure. 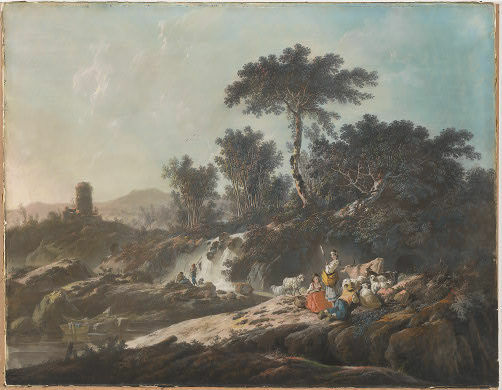 The French group has deep roots in the earliest days of the museum's existence, with the first of these works arriving in 1942, just a year after the Gallery opened its doors to the public. 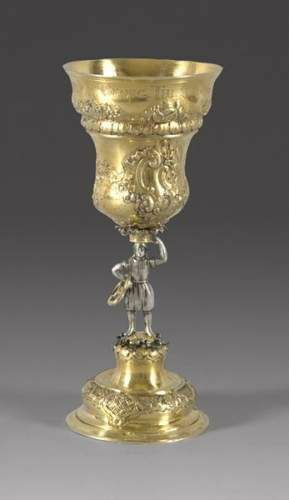 Over the next 67 years, thanks to the generosity of innumerable donors, the collection has evolved into one the Gallery's strongest and most comprehensive, and one of the finest in the Western Hemisphere. 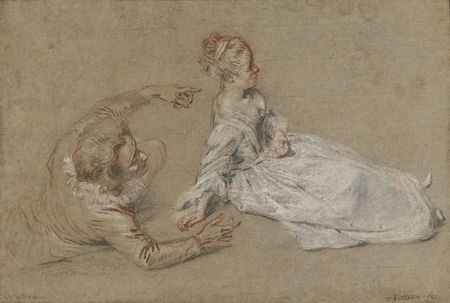 Organized chronologically, Renaissance to Revolution presents a visual journey through the development of drawing in France, from its first flowering during the Renaissance through its neoclassical incarnation during the political and social upheavals of the French Revolution at the end of the 18th century. Lorrain, and Antoine Watteau, as well as many less well-known artists. 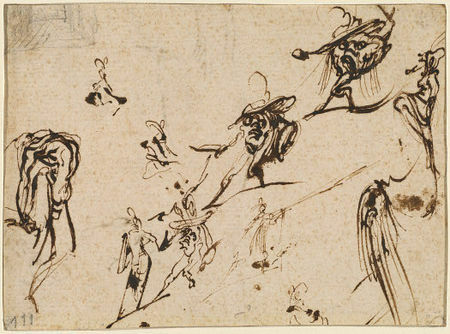 All major stylistic trends and many of the greatest and best-known artists from these centuries are represented by a rich array of works executed in a variety of styles and media and covering a wide range of functions, subjects, and genres. 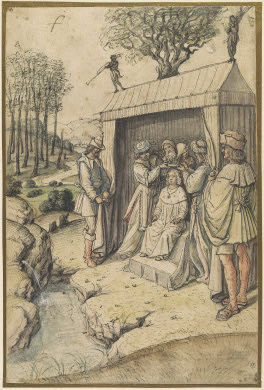 Many rare and extraordinary masterpieces are featured, such as the exquisite landscape watercolor that is the oldest work in the exhibition—The Coronation of Solomon by the Spring of Gihon by the miniaturist Jean Poyet (c. 1500), who worked for Anne of Brittany, queen of France. 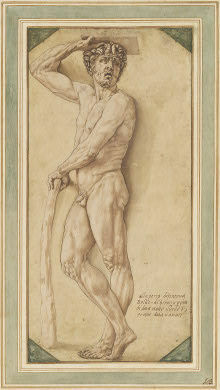 Sixteenth-century highlights include Benvenuto Cellini's drawing of A Satyr (1544/1545), made in connection with a sculpture he designed for the entrance to King François I's chateau of Fontainebleau but never completed, and beautifully wrought designs for pieces of parade armor by Cousin and Étienne Delaune. 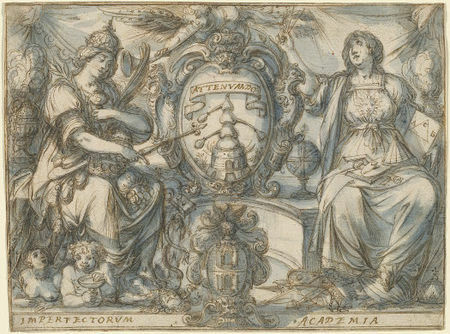 Works from the 17th century include an excellent representation of the exaggerated version of mannerism that sprang up in the duchy of Lorraine, with important works by Jacques de Bellange and Claude Deruet, and an appealing group of studies by the exceptionally inventive printmaker Jacques Callot. The turn to French classicism is demonstrated in stellar works by Simon Vouet and Laurent de La Hyre, while the timeless calm of Claude Lorrain's classical landscapes is beautifully represented in a group of drawings that includes the serenely evocative Landscape with Ruins, Pastoral Figures, and Trees (c. 1650). 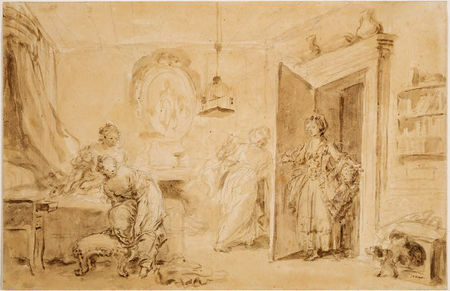 Within the exceptionally rich collection of 18th-century drawings, the major artists— Boucher, Fragonard, Jean-Baptiste Greuze, Gabriel de Saint-Aubin, Hubert Robert, and Watteau, among many others—are each represented by several works of outstanding quality. 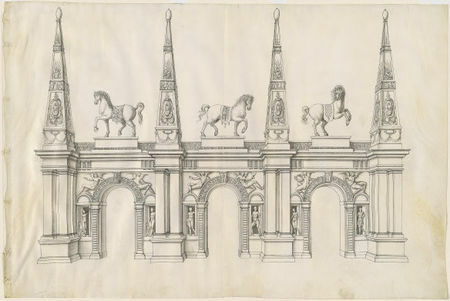 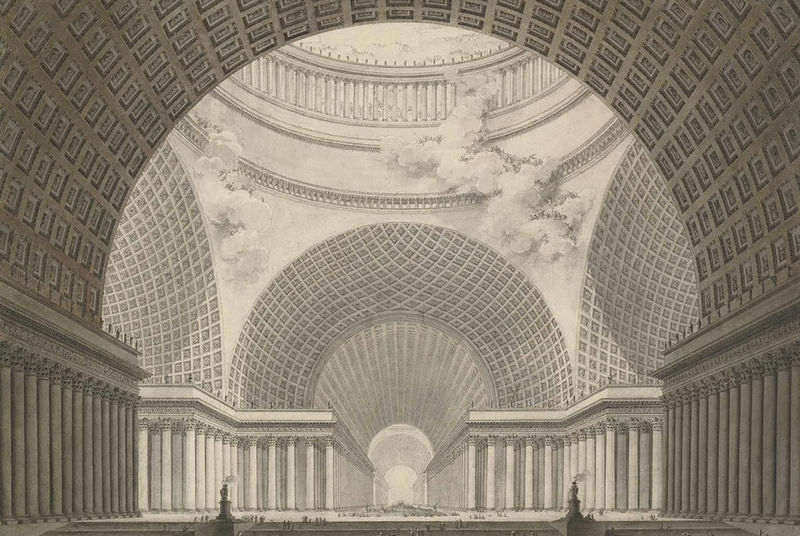 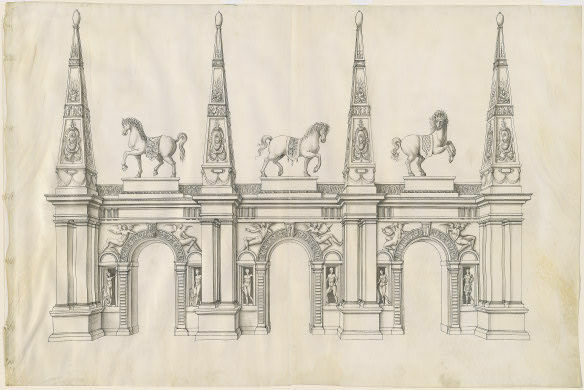 Some magnificent pieces by less familiar masters are featured as well, including François-André Vincent's Drawing Lesson (1777), arguably the most perfect representation of 18th-century French elegance, taste, and gallantry; Étienne-Louis Boullée's monumental neoclassical design for a metropolitan church from 1780/1781; and a large and beautiful pastoral scene executed in pastel and gouache, Shepherds Resting by a Stream (1779) by Jean-Baptiste Pillement. 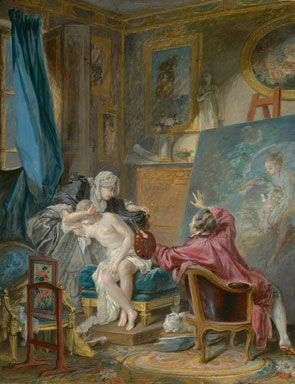 Also noteworthy is a striking group of portraits by several of the leading pastellists of the period, including outstanding examples by Maurice-Quentin de La Tour and Jean-Baptiste Perronneau, as well as a particularly dashing portrait of a young woman by Adélaïde Labille-Guiard from 1787. 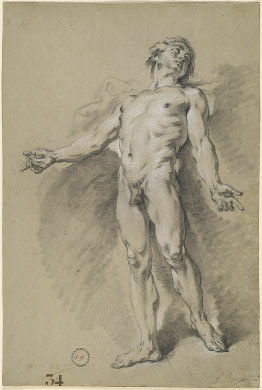 One of the youngest drawings in the exhibition is the neoclassical portrait Thirius de Pautrizel (1795) by David, an active participant in the revolution, made when he was imprisoned for his radical politics. A particular strength within the Gallery's collection of French drawings is the genre of book illustration. 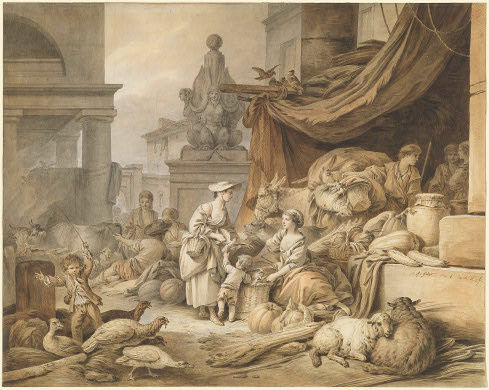 This is represented throughout the exhibition beginning with the work by Poyet and includes distinctive pieces by such famous masters as Boucher, Fragonard, Jean-Michel Moreau the Younger, and Saint-Aubin, as well as outstanding examples by other supremely gifted but less widely known artists, such as Hubert-François Gravelot and Charles Eisen.